Palm Court Bistro exists in an outdoor enclave in the middle of Suva's CBD but as part of a shopping arcade it s able to provide a small retreat, or oasis in the to & fro of Fiji's capital city. We want our customers to feel comfortable and tranquil. Good food and beverage at a reasonable price. We focus on homemade cooking and not pre-packaged 'plastic' meals. Help yourself to tomato sauce from the front, we won't charge you for small packets of it. We have a section for smokers. We are open from 7am through to 4:45pm Monday to Fridays. We open from 7am-2pm on Saturdays. We are closed during public holidays. 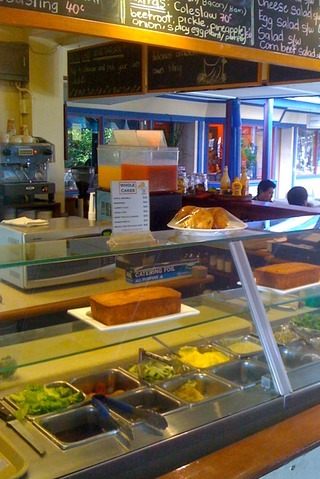 Our sandwich bar, and display of homemade cakes and muffins.